The Latin CMO Summit is the premium forum bringing elite buyers and sellers together. As an invitation-only event, taking place behind closed doors, the Summit offers solution providers and marketing executives responsible for Latin America an intimate environment for a focused discussion of key new drivers shaping the marketing industry in Latin America. This was an amazing place to share and listen to ideas and topics covered by the true leaders in the marketing industry in Latin America Forum. 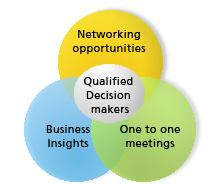 Great networking opportunities! Very good opportunity to network with CMO's from very good companies. The sessions were incredible and innovative. They tackled current issues and the success stories were very informative. We enjoyed it very much.